Homemade sausage is so good and so cheap to make that you’ll never buy it from a store again. Here’s my take on a super healthy hot Italian. Warning: I’ll keep it gore free, but there’s going to be pictures of a dead animal and its subsequent parts below. It’s nothing you won’t see wrapped in plastic on a grocery store shelf, but if you’re going to have a problem with that, maybe don’t scroll further. If you just plan on heading straight to comments and leaving some uninformed, judgmental screed about your opinion of hunting, maybe don’t bother until you read through our complete coverage of the topic first. Sport hunting, as it’s practiced in America, is the most powerful conservation tool for animals there is. I found mine in the woods. I knew there were deer around because I’d seen a couple does and it was one of those I was hoping to find as I was sneaking around, bow in hand. Then I spotted a big buck off the side of the trail, up ahead. My buddy Mat (of I almost got him killed once fame) was following along behind, so I motioned for him to stay put, then stalked forward, trying to get a clear shot. Just as I got to within 20 yards, the deer bounded up the hill, I stepped forward a bit more and found my aim. The arrow made a wet smacking sound as it hit; I knew I’d gotten him. Mine took 10 leaping bounds around behind Mat, down hill, then fell over dead. Later, we’d discover the broadhead buried in his spine; I’d shot from below, so the arrow entered low, passed through his vitals and was stooped by one of his vertebrae. I suspect he was dead before he came to a rest and the last few leaps were just reflex. Nevertheless, you don’t want to push an animal to flee further before you’re 100 percent sure it’s dead, so we waited about 10 minutes after it dropped before moving down the mountain to it. This was my first archery kill, after learning the sport earlier this year and the first deer I’ve been alone to gut. So, I Googled a couple how to videos before getting down to work. By the time I was done and a couple buddies had showed up to help us pack the meat out, it was getting dark, so we decided to take the deer back to a friend’s garage to do the butchering proper, rather than try to hang it from a tree and do it on the spot with flashlights. The presence of a deep freezer was going to be helpful, but cold beers sounded good too. I cut a pole and we tried lashing the deer’s legs to it to carry it out, but it was too heavy for two of us to lift to our shoulders, so we had to drag it. As you can see, he came to rest on a steep mountain side, so we had to drag and tumble the body down a stream bed as we slipped and stumbled and tripped over branches in the dark. The hardest part of hunting comes after you make the kill. It took four of us to lift the body onto my Subaru’s roof basket an hour later. Kuiu’s affordable Teton outers continue to perform well. And man, I am just loving the PSE Full Throttle. Its speed really compensates for the guess work that goes into estimating ranges. Back in the garage, we hooked straps through the deer’s hind legs (being careful to stay clear of the stinky glands there, they can ruin the meat) and hoisted it up onto a rafter to hang. To skin it, we cut around the legs completely, then sliced down their length. As you pull the skin away, the connective tissue stretches out and is readily apparent. You just keep pulling with one hand while you lightly tap that tissue with a sharp knife. It doesn’t take long. Once you’re down to the bare carcass, you want to take the nice cuts of meat out first. I started with the tenderloins inside the cavity, then sliced the backstaps away from the spine. The steaks you carve from the top of the rear haunches, after they’re separated from the torso. Wiley and Rufio prowled underneath, snarfing up any bits of fat or meat that fell to the floor. I also grabbed the ribs rather than turning them into sausage meat. Always wanted to try making venison ribs and these looked particularly meaty. The rest of the meat we carved away from the deer’s bones and collected in a giant plastic bag. Yellow fat is bad, and went in the trash, but this buck was covered in nice-looking white fat, which stayed with the meat. Every last little strip of meat available went into the bag, then into the freezer. The best way you can do the deer justice is by using every piece of it. I know someone’s going to call me on it, so don’t worry, that trash can was just catching extraneous parts until we had time to deal with them. The head and antlers have a good home and the dogs ate the brains. Flavor isn’t an exact science. I like a good hot Italian sausage because it’s versatile, working as well in a pasta as it does in a casserole or on its own, but figured I’d keep the spice level relatively mild, so I wouldn’t lose the meat’s flavor. That was more than enough to flavor 50lbs of venison, to which we added 20lbs of pork shoulder for its fat content. You don’t actually need a deer to make your own sausage and can just do it with cheap cuts of quality, organic pork (or wild hog!). Doing so will still give you a super tasty, super cheap product that’s then easy to cook with. This Helle Harding gets sharper than any of my other knives and its size is just perfect both for butchering and easy carry. The meat will be easier to work with if it’s lightly frozen. Cold and firm, but pliable enough a sharp knife can slice it without undue effort. 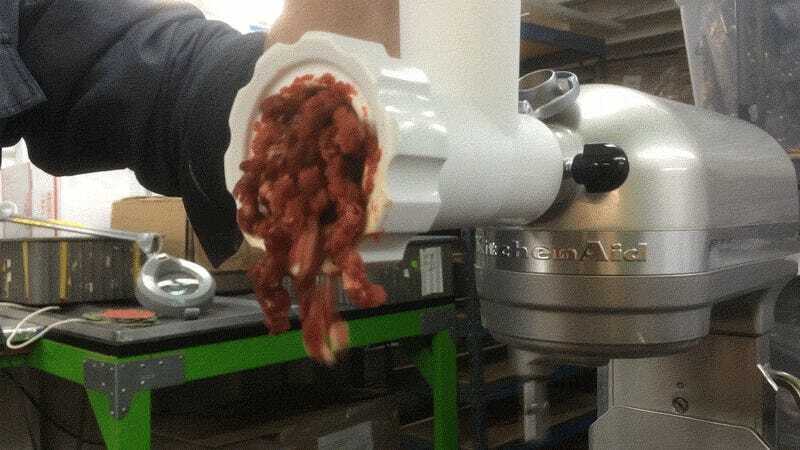 We used a KitchenAid with a meat grinder attachment to process the meat, so sliced everything into inch-thick slices so it’d fit in the machine. Once sliced, it was back into the bag, the spice mix was dumped on top and we then mixed it all together by pounding it around on our work surface. Feeding the grinder is a simple, but time consuming process. 70lbs of meat takes about an hour to go through. This first grind did a good job of breaking down the meat and exposing its freshly opened cells to the spice mix, but didn’t really create a homogenous mix of pork and venison, so we re-froze the ground meat overnight and repeated the once-inch-thick slices and grinding process again the next day. As the product of that second grind was coming out of the grinder, we caught it on butcher paper, eyeballed what we guessed to be about a pound each time, and individually wrapped each before loading them into the deep freezer. If you know me, expect to be handed one or two of these packages in the near future. I didn’t bother with sausage casings. With so much meat, that would have been a ton of extra labor and I don’t really like having the casings when I use the sausage in another dish. If you want to just throw this stuff on the grill, you can just form it into a patty first. I left 20 of those packages with my friends and brought 50 home with me. Last night, I cooked dinner for my 11-year old buddy Karma. Homemade pasta sauce, brown rice penne and venison sausage sauteed in coconut oil. She says it was great.